Fire incidents are very devastating. Victims do not only experience burns and emotional trauma, but they also don’t get to keep any of their possessions. In worst-case scenarios, victims could be trapped in rooms and buildings until they suffocate, burn, and die. But luckily, we have firefighters to save victims and put out the fire before it causes any more damage. The role of firefighters is crucial, and it should be clearly laid out to ensure proper task assignment and the safety and security of each member of the team. 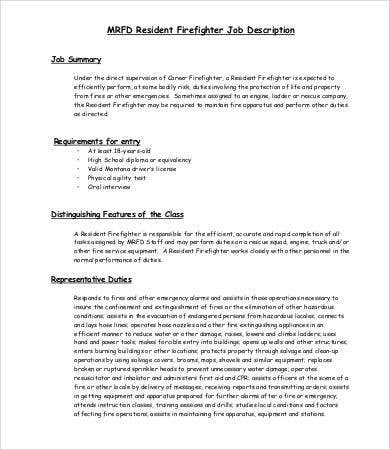 Hence, a well-made firefighter job description should be created to ensure firefighters are well compensated for their duties. We have a whole host of job description Samples as well for careers ranging from HR positions to police officers. 1. 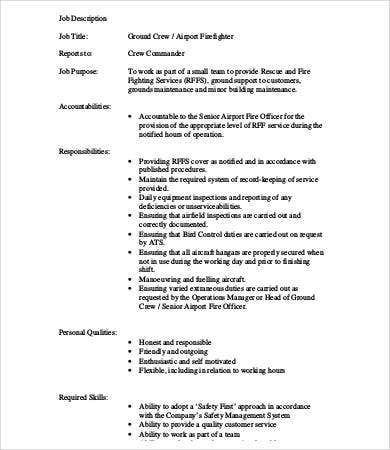 What Exactly Firefighters Do? 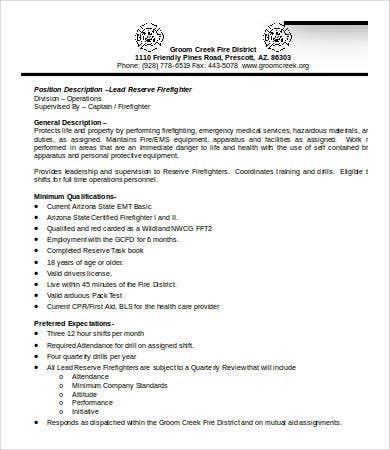 In this page, you can browse and download different job description templates for firefighters. 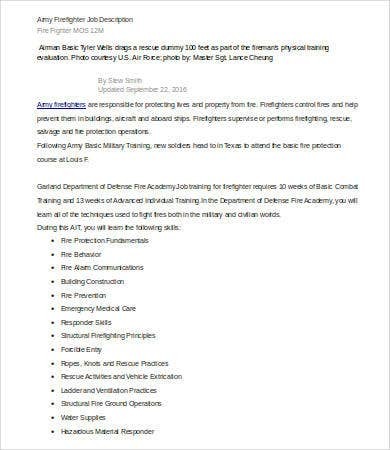 There are templates suitable for project firefighters, army firefighters, and paramedic firefighters. 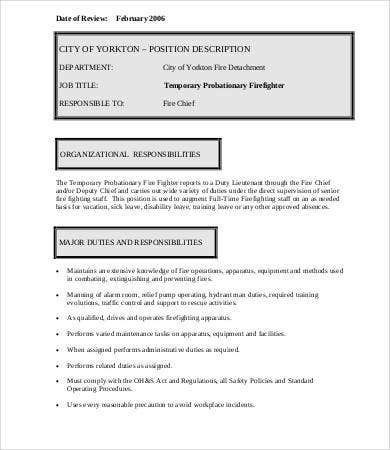 We are not limited to firefighters as you can also find related job templates from our collections, such as chief operating officer job descriptions. Emotional distress. Frequent life-threatening experiences often affect a stable mental state. Physical impairment. Aside from getting cuts, burns, and bruises, firefighters have high risk of getting cancer. Poor personal life. With a 24-hour work schedule, there is less time for families and loved ones. 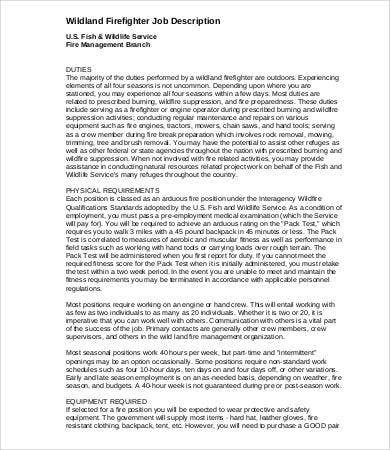 Being a firefighter is a job individual would like to take pride in. Hence, more people come in as volunteers. 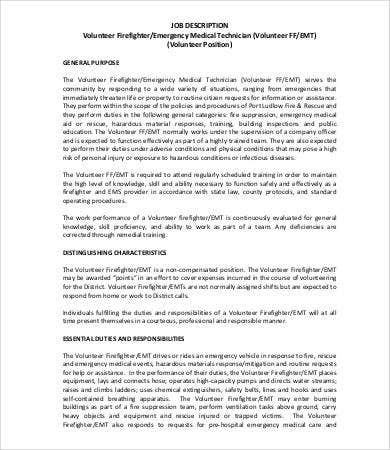 Let volunteer firefighters know and understand more about their jobs. 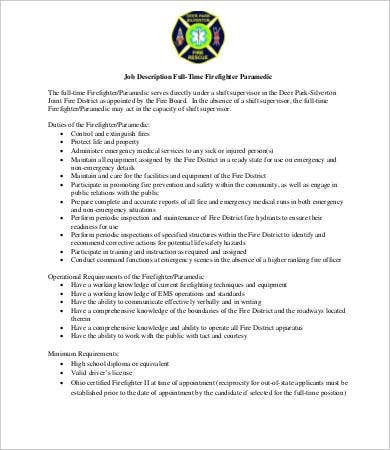 In order to do that, fire departments need a comprehensive firefighter job description. 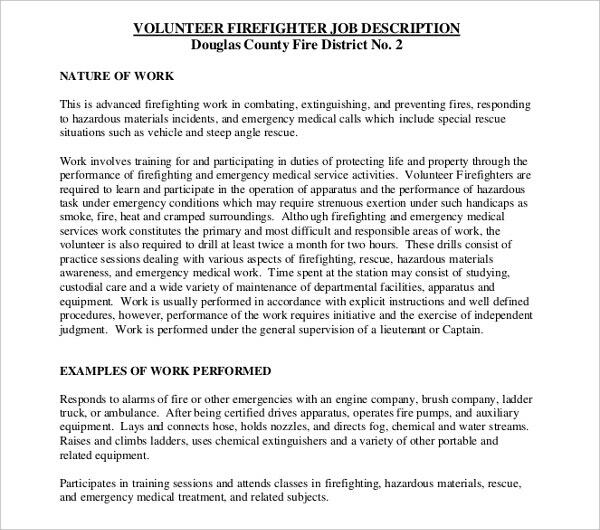 In this page, you can choose any template that best fits the firefighter specialization you’re looking. Each template is well researched to ensure quality, reliability, and utility. 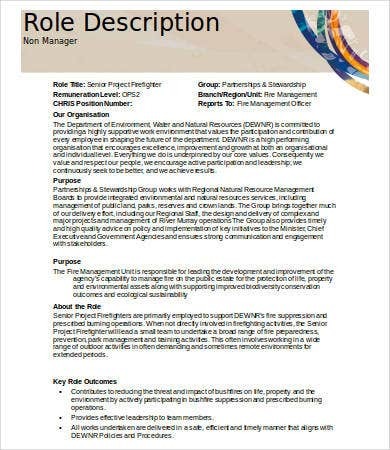 You can download these job description templates in either Microsoft Word (.doc or .docx) or PDF file format. If you opt to make your own version, you can download many templates and use them as references. Firefighters are often taken for granted. 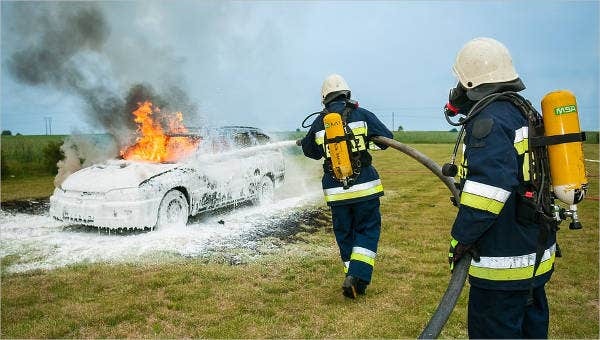 When fire incidents happen, people will less likely care about these professionals, but when something goes wrong, firefighters receive all the blame. People should know how valuable these professionals are. 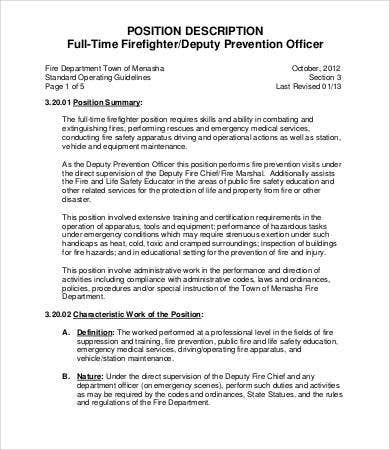 To point out more clearly, there are reasons why they should be regarded as heroes: You may also see Security Guard Job Description Templates. They put their lives in danger to save others. They sacrifice their personal life to comply with a 24-hour work schedule. They take the risk of getting burnt and serious injuries to put out the fire.